Back before high-speed communication and jet flight made it possible to travel almost anywhere in the world in just over a day, the Age of Discovery saw adventurers travel into unknown lands and waters to reveal the true extent of the world they lived in. Click here to play! Discovery was not the only purpose behind these voyages, however, as new trade goods were well known to guarantee the fortunes of those successful adventurers who were lucky enough to return from their travels. In the Age of Discovery slots, you must line up the right cargo to take home, and amass the navigational equipment necessary to discover new lands. Bananas, avocados, mangoes, rock melon and other amazing new fruits will earn a pretty penny back home as trade goods. Charting sea monsters will help the universities, though, and your crew could also reclaim lost caches of gold to make even more money on your return. There are many rewards awaiting brave explorers, but also many perils. Few adventurers return with anything of value. Few even return. 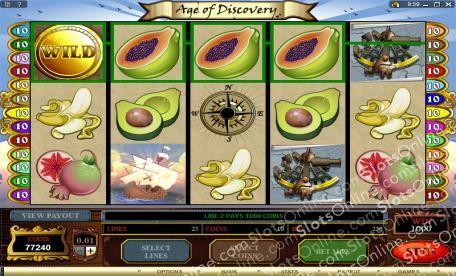 Maybe you have the combination of bravery and dumb luck to take your ship around the world and back in the Age of Discovery slots. There's only one way to find out, though, so set a course for adventure today! The Sea Monster symbol is the scatter symbol, providing wins on the total bet when 3 or more appear on the reels. 3 will win 5 times the total bet, 4 will win 20 times the total bet, and 5 symbols wins 80 times the total bet. Gold Coin symbols can substitute for any symbol other than scatter symbols. They also offer the highest payouts, with 5 Gold Coins on a payline winning 6000 coins for the player. The bonus game is triggered when 3 or more Compass symbols land on the reels. In it, players choose Xs marking treasue until a skull shows up. Most Xs mark an amount of treasure that represents a bonus win in coins. Once a skull has been chosen, an extra win amount is also awarded and the game returns to normal play.